The problem of heating of optical components during the formation of the high-power continuous-wave fiber laser radiation is considered. The results of experimental measurements of heating of optical components made of the domestic quartz glass of the KU-1 brand and yttrium aluminum garnet crystal are presented. The time dependence of the heating temperature of the optical components and their stationary temperature are investigated as functions of the laser radiation power. Translated from Izvestiya Vysshikh Uchebnykh Zavedenii, Fizika, No. 12, pp. 146–152, December, 2018. 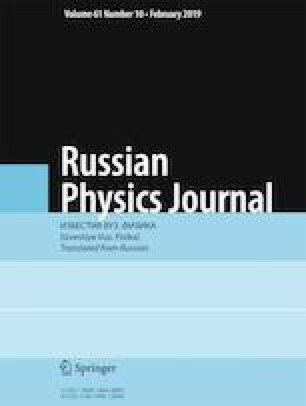 P. A. Nosov, A. F. Shirankov, R. S. Tret’yakov, et al., Izv. Vyssh. Uchebn. Zaved., Priborostr., 59, No. 12, 1028–1033 (2016); DOI: https://doi.org/10.17586/0021-3454-2016-59-12-1028-1033. P. A. Nosov, A. F. Shirankov, A. G. Grigoryants, and R. S. Tret’yakov, J. Phys. : Conf. Ser., 584, 012006 (2015); DOI: https://doi.org/10.1088/1742-6596/584/1/012006.